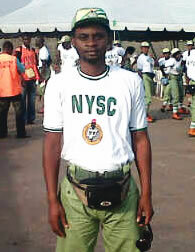 A member of the National Youth Service Corps, Alli Bello, has threatened to sue the State Security Service for allegedly detaining him for nine days. Alli, who is observing his one year national service in Lagos State, also said he would sue Mr. Kolawole James, for causing his detention after he accused him of robbing him. The corps member said he was quizzed by the operatives of the SSS on September 17 and detained at the Lagos office of the agency for five days and at the Abuja office for four days. Alli, a graduate of Mathematics, University of Ibadan, said he was shocked on September 21 at the SSS Asokoro office when James said he robbed him. He said, “On September 17, three SSS operatives arrested me in Agege area of Lagos and drove me down to their office in Shangisha. “When I was taken to Abuja SSS office, James who I had never met in my life accused me of robbing him at the Abuja Airport area after taking him and an Alhaji on a ride. Alli said he was rattled by the allegations as he had neither been to Abuja nor driven a car all his life. He added that on August 15, the day the he purportedly robbed James, he was at his place of primary assignment where he taught students preparing for General Certificate of Education Mathematics lessons and also slept at his Lagos residence. He said it was discovered that he was a victim of mistaken identity when James claimed he added him on BlackBerry Messenger and got his pictures from there. He said, “During examinations and re-examinations it was revealed that James who had worked with my sister-in-law, Toyin Bello, in Lagos was once a contact on my BlackBerry phone which she (Toyin) gave to me. “It was realized that James must have backed up contacts on his stolen BB phone because he also claimed to have sent me friendship request which I obliged. Alli said he was released on bail on September 26, after one of the SSS operatives who claimed to be the head of the legal team, said he did not want an innocent man to suffer. He said, “After releasing me on bail, they neither apologized nor formally vindicated me of all the charges. As a matter of fact, they said my detention was only part of their normal investigation process. “Throughout the nine days I was in detention, I was made to undergo emotional and psychological torture and treated like a common criminal for what I know nothing about. Toyin said all efforts to convince James that the incident was a pure mix up proved abortive. “I was even the one that sent to him the PIN of his lost BlackBerry phone when he needed it,” she said. But James, who spoke with our correspondent on the telephone on Thursday, insisted that Alli led the robbery attack on him. Asked about how he tracked Alli, James said, “I synchronized the Bold 2 phone that he stole with a Storm BB phone before the incident happened. “By virtue of this, as new contacts were entering the stolen phone I was also getting the request on my Storm BB. Fortunately for me, I added him in that process and spotted his picture. Adebisi added that the action of the SSS operatives was synonymous with attacking an innocent person. He said, “Our client’s nine-day detention has caused him and members of his family serious psychological trauma which they may not get out of if the record is not put straight now for future prospects. But, the Lagos State SSS Director, Achu Olayi, said the operatives of the agency only acted on instruction that Alli should be arrested and brought to Abuja. “I don’t have facts about the issue or the offences he might have committed. Contact our Abuja office for any information relating to him,” he added. When contacted by one of our correspondents in Abuja, SSS Deputy Director, Media and Public Relations, Marilyn Ogar, said she was not aware of the case and therefore could not comment on it.